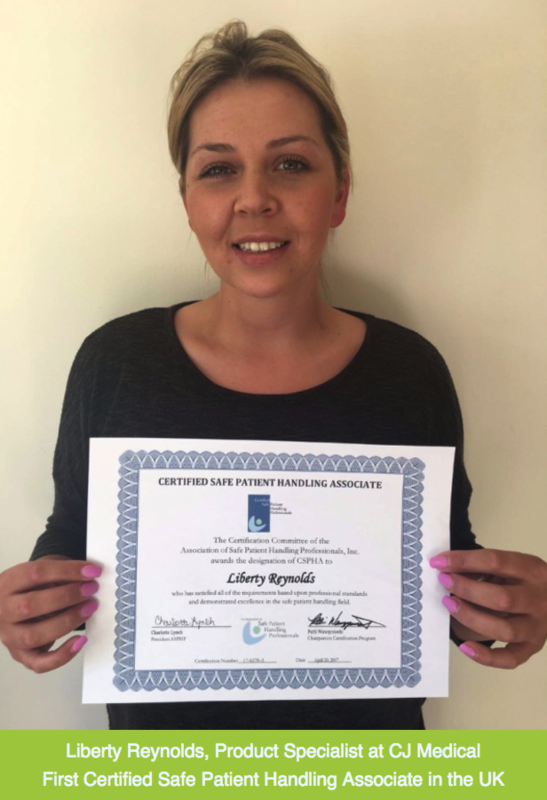 The Association of Safe Patient Handling Professionals (ASPHP) Certification Program Committee has awarded Liberty Reynolds, CJ Medical Safer Patient Handling Product Specialist, the designation of Certified Safer Patient Handling Associate. Liberty's expertise and commitment to the practice of safe patient handling and mobility has been recognised by the ASPHP Certification Program. Liberty has spent six years at CJ Medical, Distributor of Safe Patient Handling products, working closely with Acute NHS Hospital Trusts, Private Hospitals and Care Homes, helping customers to determine suitable equipment for internal patient handling programs. Liberty has also been working with the independent Safe Patient Handling Consultant to conduct risk assessments within the hospitals and advise on the range of specialist equipment to help reduce patient handling and staff injuries. The equipment range, which promotes safer patient handling, improves patient outcomes and helps to reduce the incidence of staff Musculoskeletal Disorders, includes Air-Assisted Lateral Transfer Devices such as the HoverMatt®, Falls Prevention Kits and Flat Lift Solutions, Patient Turning Technologies and Safe Patient Positioning Systems. Liberty facilitates direct, competency-based training for hospital staff which includes validation of skills, evaluation of staff equipment knowledge and an ability to operate the specialised equipment properly, resulting in a significant decrease in staff injuries as well as improved patient outcomes. “Being the first in the UK to achieve my CSPHA qualification feels a fantastic achievement and I look forward to putting my skills into further practice."